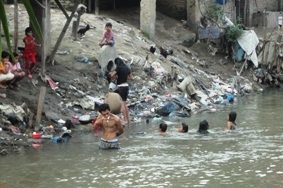 In parts of Indonesia, waterways are used to wash clothes, bathe, deposit litter, and sometimes used as a toilet. Indonesia is a beautiful place full of people with ready smiles. It is a democratic country with a rich cultural history. Given it is identified as one of the rising Southeast Asian economies, I was excited to see the state of water here. While our Indonesia WATER SMS Project is working on water services, a long time passion of mine has been urban waterways. I’ve always looked at urban waterways as the soul of a city. They are the reasons that human settlements emerged, and can be such a focal point of an urban area. What stories would waterways in Indonesian cities tell? Sadly, it was all too similar to what can be seen in India, Africa, and Central America. It always amazes me that so many of the waterways running through cities are running sewers. A site that could be such a source of beauty is often polluted and littered beyond recognition. In India, Indonesia and in many places, the poorest communities, who often don’t have adequate water and sanitation services, can be found living next to waterways. The water is used to wash clothes, bathe or deposit litter, and the waterway is sometimes used as a toilet. What could be high value “river-front” property (!) is instead the smelliest, dirtiest part of the city. My hope is that one day in Jakarta, Malang, Chennai, Mumbai and cities across the world, buildings can face towards the water and people can find recreation along the banks of waterways. Wouldn’t it be amazing if waterways that at one time created reasons for people to build cities, could once again become the soul of the city?